Opened in 1912 the San Francisco Municipal Railway or Muni was one of the first publicly owned transit systems in the country. Today the city ranks second in the nation with the highest percentage of commuters who use transit, behind only New York City. 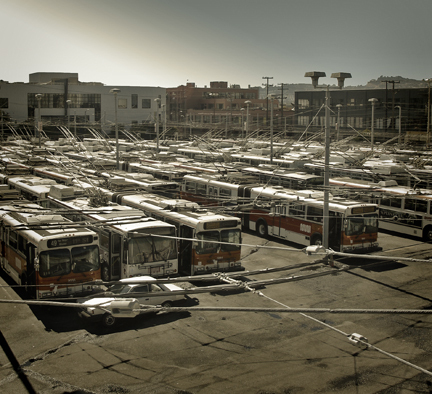 Muni operates about 1,000 vehicles including buses, under and above ground streetcars, cable cars, and trolleybuses. With regard to environmental concerns nearly all of the buses have bicycle racks and the Muni system has over 300 zero-emissions trolleybuses powered by overhead electrical wires like those shown above.